2. 1. - The German commander in Serbia, under the threat of the death penalty, forbade hiding Jews and keeping their belongings. 4. 1 - Hungarian army and gendarmerie smashed the First Zablja NOP detachment in Žablja, starting reprisals against civilians in Bačka, culminating in Novi Sad raids. 15. 1 - Refugee government of Yugoslavia and Greece concluded an agreement providing for their postwar confederation (Balkan Federation). 15. 1. - 7. 2. 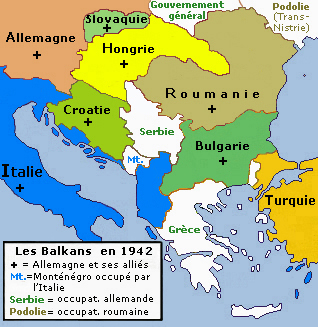 - "Second enemy offensive" in eastern Bosnia, in two stages: Roman-Bircanska and Second Ozrenska Operation; Chetniks cooperate with the German unit, the Partisans escape destruction. Machine gun M87 - naval version is formed by mounting of machine gun M87 to rotating the base that is placed on a bell-shaped mount. It is mounted on a vessel or vehicle by connecting the mount to the foundation with bolts. Quick and easy change of height is achieved with elevation system placed in rotating base. The design of the machine gun provides reliable function, without stoppages, in all environments. It is a gas operated weapon, with sliding block breech as the locking system. The barrel is cold forged, with a chrome plated interior, which provides long service life with unchanged ballistic characteristics.